Click here to see important INTERNATIONAL shipping information. 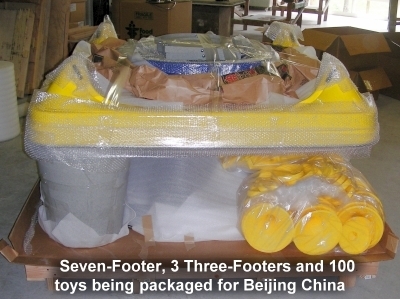 Crating and Packaging: Two and Three-Footers are packed in boxes that are considered "oversized" for purposes of shipping. The Wells are not heavy, but they take up more space than their weight normally requires, so they ship at oversized rates. Packaging includes padding around the rim. Three-Footers ship in two boxes. The smallest box contains the base and weighs 12 pounds (5.5 kg) and is 20" x 20" x 18" tall (59cm x 59cm x 46cm). The largest box contains the funnel, sign frame, and launch ramps, and weighs 26 pounds (11.8 kg). When packaged for shipments within the USA, the dimensions are 34" x 34" x 13" (86.3cm x 86.3cm x 33cm. When packaged for international shipments, it is 35" x 35" x 13" (89cm x 89cm x 33cm). Two-Footers ship in one box that weighs 35 pounds (15.9kg) and is 24" x 24" x 22" (61cm x 61cm x 56cm). Multiple Quantities: Fortunately, we can nest the parts to reduce the shipping cost of each additional Well ordered at the same time. For instance, a second funnel adds 4.5" (11.4cm) to the height of the funnel box, and 2" (5cm) to the base box. 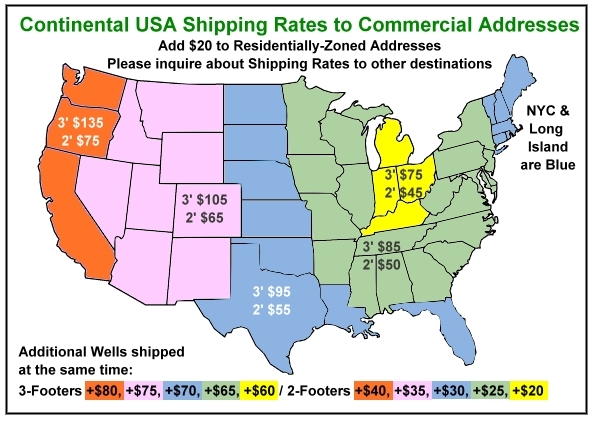 To commercial addresses in the Continental USA, each additional Well only increases the shipping cost $40 each for Three-Footers, and $10 each for Two-Footers. We will gladly quote the international shipping for any quantity you need. BONUS: There is "open space" in these large boxes, so if you want to order some Miniature Well Vortx's, up to 25 of them can be fitted into The Three-Footer packaging, and 20 into the Two-Footer packaging at no additional shipping cost. Shipping Cost: While the Wells are not very heavy, they are large and the shipping rates area based on the dimensions. We are paying half the shipping cost for orders placed before the end of this month. The following chart shows your share of the discounted shipping cost if ordered in April. Shipping Size: The total dimensions including the pallet are 72"x72"x46" high (182.8cm x 182.8cm x 116cm). The total weight is 240 pounds (109 kgs). It ships as Class 250 freight. When one Seven-Footer is ordered, the packaging is a "DO NOT STACK" format. It is possible to unstrap the padded crating from the pallet and hand-lift the Well off the truck. Two average-strength men can lift it, but four are better. It is not terribly heavy…just bulky. Be advised that it may arrive in a large truck as we do not have any control over the size of the delivery vehicle. When you ask for a shipping quote, please let us know if you have a loading dock and fork-truck, or if it will be lifted off by hand. Padded Crating: Seven-Footers are padded inside a heavy-duty 3-piece crate and strapped to a custom pallet.